Once the money bubble burst in the $50,000 Player's Championship, the final 16 players receive questionnaires that they need to fill out. Why? This information gives ESPN commentators Norman Chad and Lon McEachern things to talk about during the show. The questions cover everything from the players' career highlights in the game to what they were doing before they played poker. Michael "The Grinder" Mizrachi is in the foreground, with a smiling Lyle Berman in the background. 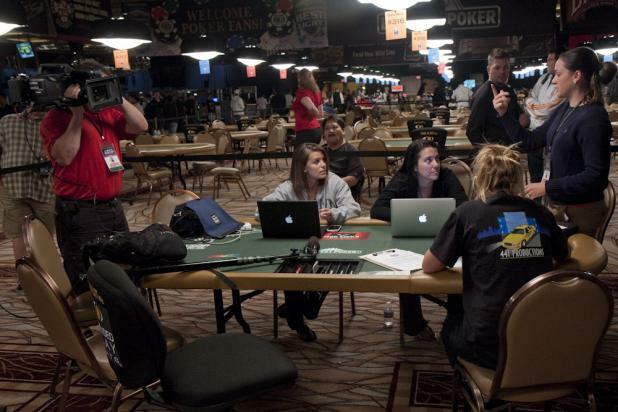 Once the $50,000 Player's Championship reaches the final two tables, the crew from 441 Productions is on hand to record the action for ESPN as the final 16 players fight for the final table. Production Manager Sari Bickford (right) gives last-minute instructions to the crew. With the money bubble approaching in Event #2 ($50,000 Player's Championship), James Van Alstyne (second from the left) is all in during a hand of seven card stud hi-lo. 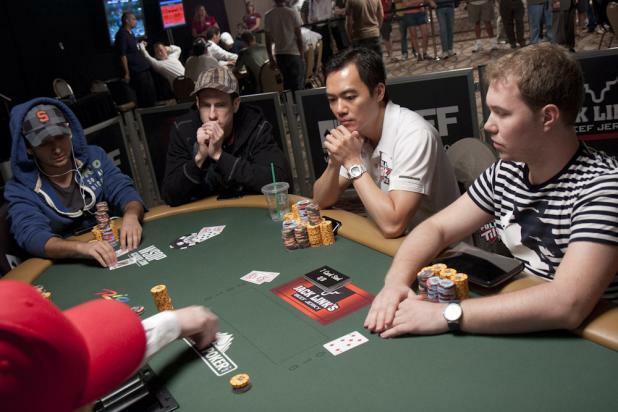 Allen Bari (left) and Alexander Kostritsyn (right) played the hand for a side pot while Van Alstyne awaited his fate. 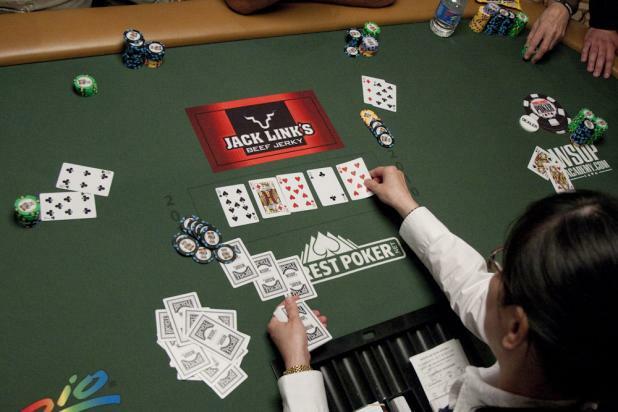 Van Alstyne finished the hand with a pair of jacks, losing to Bari's pair of kings for the high, while Kostritsyn split the pot with a 7-5-4-3-2 for the low. James Van Alstyne was eliminated in 20th place, missing the money after four days of play. 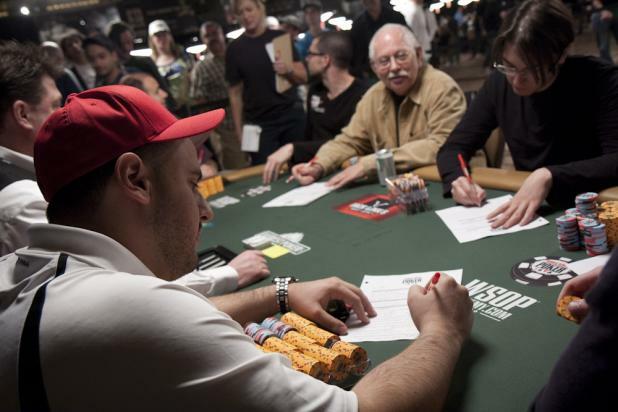 Phil Hellmuth holds the career record for WSOP bracelets with 11, but some critics argue that it's less impressive because all his victories came in hold'em events. 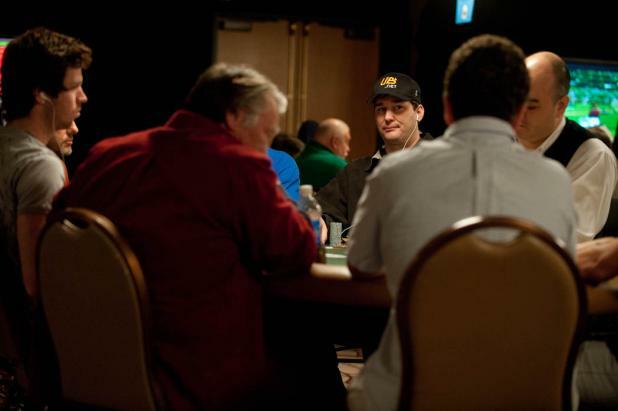 In Hellmuth's defense, he has 16 WSOP final tables in non-hold'em events, including four top-3 finishes. Unfortunately, Hellmuth busted in the first half of Day 2, so his first non-hold'em bracelet will have to wait. 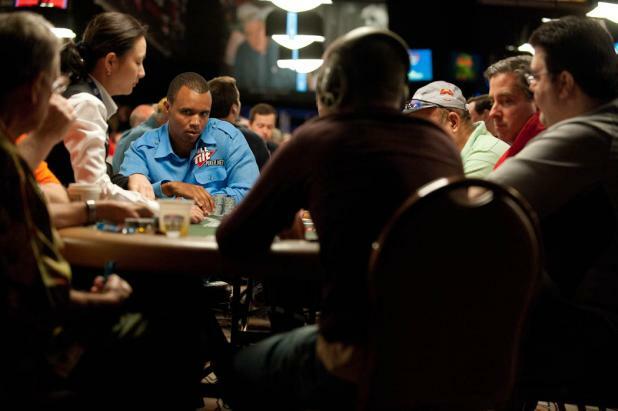 Day 2 of Event #4 ($1,500 Omaha Hi-Lo) began with 274 players, but even in a crowd that large, Phil Ivey stands out. Ivey was hoping to reach the final table so he could play for career bracelet #8, but he was eliminated before the field even reached the money. But there are plenty of bracelet opportunities left for Ivey this year. Andrew "LuckyChewy" Lichtenberger (standing, red hat) was having a lot of fun in the middle of Day 1 of Event #5 ($1,500 No-Limit Hold'em), reportedly drinking plenty of shots of alcohol while playing, and becoming a very loud and happy drunk. Still only 22 years old, Lichtenberger has earned more than $1 million in live tournaments in the past year, with five cashes at last year's WSOP that included a second-place finish and reaching the final two tables of the WSOP Main Event. In this photo, Lichtenberger is spreading his alcohol-induced happiness to Daniel Negreanu's table, which has a surprisingly tough lineup for a large-field event -- in addition to Negreanu, this table has Christian Harder, Isaac Haxton, and Josh Schlein. In the first half of the day for Event #5 ($1,500 No-Limit Hold'em), Lauren Kling (left) sprinted out of the gate and built her stack to nearly 10 times the starting amount, putting her comfortably above the rest of her table and among the tournament chipleaders. 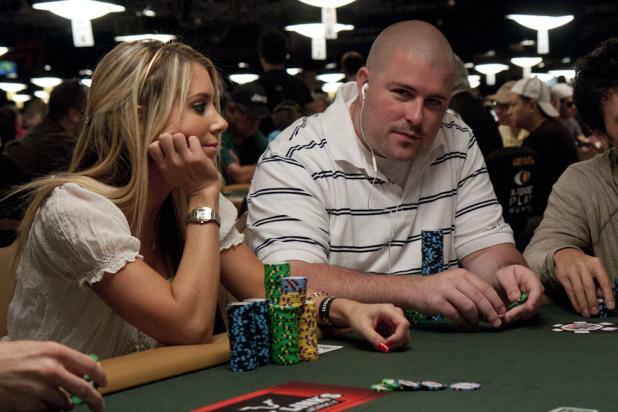 Matt Brady (right) had to settle for a more average stack, but at least he had position against Kling. 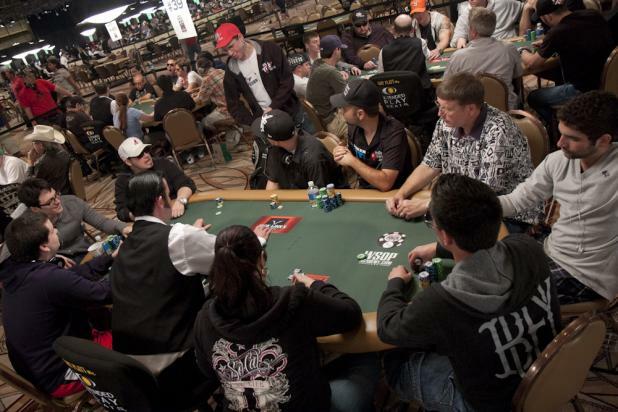 The lower buy-in events tend to have a lot of action in the early levels, as many players try to build up a big stack early. On this table in Event #5 ($1,500 No-Limit Hold'em), there was a three-way preflop all-in with Q-Q against 8-8 against 7-6 suited. The queens held strong until an eight fell on the river to bust the other two players.